The Churchill Project - Hillsdale College > Articles > Q & A > Churchill in WWII > The Arts: “What are we fighting for”? A: This alleged quotation was ascribed to Churchill some years ago by the Village Voice, and has since migrated widely throughout the Internet. Unfortunately, our best efforts fail to find it among Churchill’s 15 million published words of speeches, papers, letters, articles or books. The quote was reprised more recently by actor Kevin Spacey to Chris Matthews of MSNBC, though the YouTube post nicely corrects the misquote with a textual overlay. I had an interesting exchange with Mr. Spacey at the time, who was grateful for the correction. The arts are essential to any complete national life. The State owes it to itself to sustain and encourage them. The country possesses in the Royal Academy an institution of wealth and power for the purpose of encouraging the arts of painting and sculpture…. The Prime Minister [Neville Chamberlain], who spoke with so much feeling and thought on this subject, has reminded us of the old saying that it is by art man gets nearest to the angels and farthest from the animals. Indeed it is a pregnant thought. Here you have a man with a brush and palette. With a dozen blobs of pigment he makes a certain pattern on one or two square yards of canvas, and something is created which carries its shining message of inspiration not only to all who are living with him on the world, but across hundreds of years to generations unborn. It lights the path and links the thought of one generation with another, and in the realm of price holds its own in intrinsic value with an ingot of gold. Evidently we are in the presence of a mystery which strikes down to the deepest foundations of human genius and of human glory. Ill fares the race which fails to salute the arts with the reverence and delight which are their due. Featured Image: Winston Churchill Painting the Mill at Dreux, by Paul Maze 1932, Oil on canvas 18 x 12.5 in. National Churchill Museum, Westminster College, Fulton, Mo. Part of an exhibition at Hillsdale College, January-March 2017. Paul Maze (1887-1979) met Churchill in the trenches of Flanders in 1916. With their shared love of art they became lifetime friends. Maze fought with the British Army. For his postwar memoir, A Frenchman in Khaki, Churchill wrote the foreword. 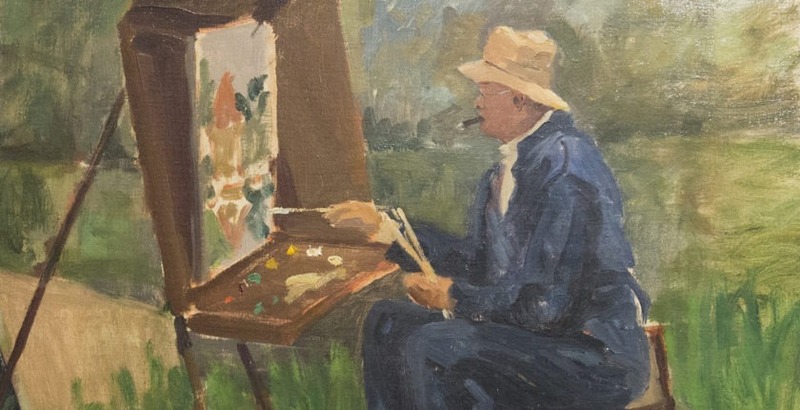 Known as “the last of the Post-Impressionists,” Maze specialized in English themes like the Henley Regatta, yachting at Cowes, and Trooping the Colour at Buckingham Palace.